It may seem self-evident to point out that seeing an atomic explosion was the single most terrifying thing I have ever seen in my life. When I saw it explode, I was not aware of Robert Oppenheimer’s quote: “Now I am become Death, the destroyer of worlds.” When I read that quote several years later, I had no difficulty at all understanding what he meant. Unlike Oppenheimer, I was not responsible for the existence of the bomb, but the explosion was such that it seemed to be destroying a fabric of reality in front of my eyes. I think the thing that is most shocking about watching an atomic explosion is the fact that for the first few seconds there is…silence. You see the cloud slowly begin to rise, and you wonder: where is the deafening boom? The cloud grows larger and larger, seeming to absorb and expel all of the matter in its vicinity. You continue to watch, bracing yourself for the sound, but it does not come. Just when you are at the point where your brain begins to reconcile the fact that you are watching an explosion that will generate no sound at all, you are suddenly hit with a wave of deafening thunder. We were miles away, but the entire mountain we stood on trembled with such force I was certain it was going to collapse around us. Growing up in California, I have endured about a dozen earthquakes, including the Loma Prieta earthquake in 1989 that leveled significant parts of the San Francisco Bay Area. No earthquake could even compare to the rumbling of the earth I felt that day. I stared helplessly as the cloud expanded and rose, dwarfing the hills and mountains behind it. As it expanded, growing thousands of feet every second, I would become convinced that it couldn’t possibly grow any larger. Then it would. Then I would try to convince myself that it was now as large as it possible could be. Then, a few seconds later, it would be twice the size it was before. Looking back on it, I realize now that I may have actually been bargaining with God: please don’t make it any larger than this. Or this. Or this. And each time it did, I could feel more of the planet dying, more of my family history being obliterated, and my connection to my ancestors slowly eradicated. I felt alone, found myself questioning the meaning and purpose of any human being alive. If we could do this, we didn’t need God. We didn’t need the devil. We had accomplished the task of making our entire civilization disposable, and virtually every other living creature along with it. 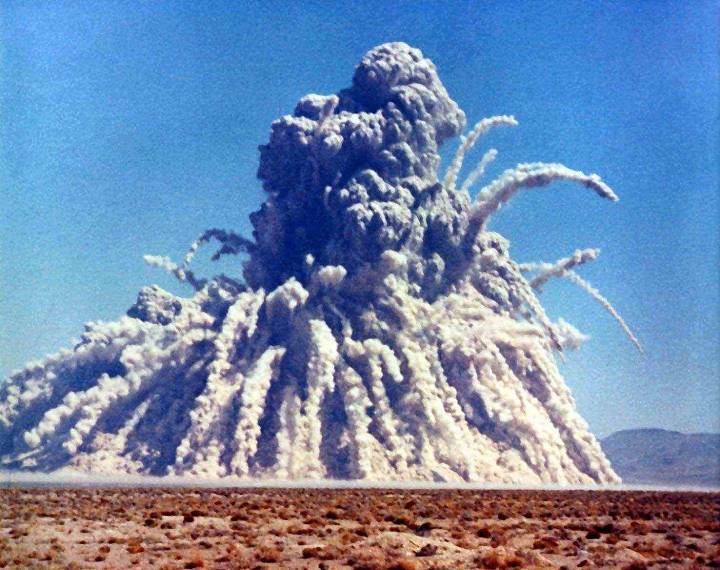 Bill Bryson wrote in his memoir of growing up in the 1950s how Americans felt indestructible, so much so that tourists used to picnic in the desert and watch the bomb explode. After words, scientists would scan them with Geiger counters to see how radioactive we were. This was also the time that we thought that a turtle named Burt could teach us to “Duck and Cover” so we could survive a nuclear attack, and that bomb shelters were worthwhile investments. I am often tempted to laugh at those absurdities, but when I think about the explosion I witnessed, I find it almost impossible to do so. I stared at him a moment, not really comprehending everything he meant by that. Finally, some part of me seemed to understand, so I nodded as my sobs grew louder. He pulled me into an embrace and let me cry into his chest. I still remember the scent of leather and tobacco that filled my nostrils. And you know something? I’m still nodding to him. Even today. Because that day changed me forever.